The last couple of years have certainly put the "great" into Great Britain. Since The Royal Wedding, The Jubilee, The Olympics and the arrival of Prince George as a nation we have never been so patriotic in recent times. This month our travelling actuary, Eve Hartridge takes us to two of her favourite UK finds where no passport is required. In the last year I've been lucky enough to visit some wonderful locations and stay in some stunning hotels. There have been two experiences that have really stood out and they couldn't be more different in most ways. One is regarded to be in the Top 5 best luxury UK hotels with a multi award winning restaurant, cookery school and flawless staff of many. The other is a luxury guest house on The Isle Of Wight run by a husband and wife team who I genuinely now regard as my friends. 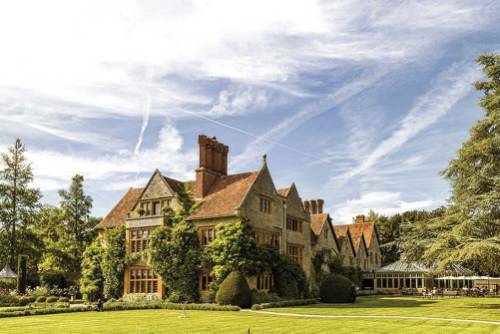 Both hotels I cannot fault in anyway and look forward to returning to in the near future as they are my "Best of British"
The location of Le Manoir is utter rural idyll. The approach is just beautiful along the meandering country roads of Oxfordshire to reach the village of Great Milton. 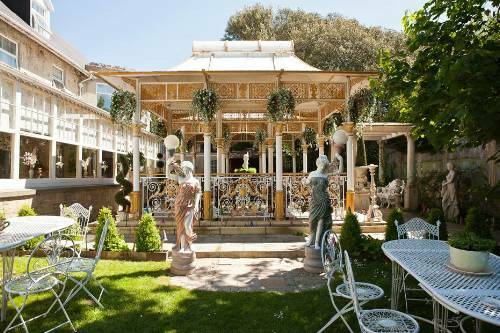 This world famous restaurant and hotel has been a feature in the village since 1984 when it was first opened by honorary Brit, Raymond Blanc OBE. Before the celebrity chef craze took hold, Raymond (or RB as all of his staff affectionately refer to him as) was establishing his reputation of brilliance in basic cookery which forms the foundations of every dish. Le Manoir has held not one but two Michelin stars for nearly thirty years which puts the restaurant into an elite category for consistent excellence. Le Manoir is just that, RB has lovingly restored The Manor house of Great Milton and converted various outbuildings into opulent rooms and suites. I stayed in the Arabesque Suite which is stylishly decorated throughout in dark neutrals. The suite is perfectly equipped for business or pleasure with bedroom, living area, work space and an enormous marble bathroom. Away from the main house the suite was peaceful and enjoyed far reaching views of the countryside. The short walk to the main house for dinner was only slightly dampened by a thunderstorm, however as if by magic, large golf umbrellas appeared outside of our room so we needed have worried. The restaurant is an absolute favourite for special occasions and celebrations, for non residents, booking is a necessity and I believe that due to RB's new television program there is a small waiting list. It would be wrong for me to say that this is a restaurant with rooms however I don't suppose anyone stays here and chooses not to dine on-site. The atmosphere in the lounge bar is so friendly and positive. All diners are looking forward to their dinner with gleeful anticipation. There is little formability, however, with the 'special occasion' feel in the air, the atmosphere is incredibly joyful and without a strict dress code in place, everyone looks well attired. There are several menu choices in the restaurant but most guests opt for one for the tasting menus with paired wines Dishes are seasonal and where possible herbs, vegetables and salad is sourced from a few feet away in the Manoir's kitchen garden. The menus change with the seasons but one consistent course is the cheese from RB's region of Franche- Comte. The same cheese is presented at different levels of maturity and accompanied with a glass of Vin Jaune from the same region. It is absolutely delicious and will leave your taste buds tingling but don't over indulge as pudding is also unmissable! Le Manoir run a number of cookery classes under the watchful eye of Chef Mark Peregrine who was Raymond Blanc's first ever apprentice. The Cookery School is aimed at those who love to cook and are keen for fresh inspiration or people like me who get a little overwhelmed in the kitchen. The school is set up into various work stations that resemble a kitchen at home, the classes don't take place in the main restaurant kitchen for obvious reasons! Mark is a fantastic teacher, he makes the day relaxed, fun and most of all enjoyable. I learnt so much from the few hours we all spent together from the importance of fresh ingredients, to how easy it is to ruin good olive oil and how most people cook on too high a heat. Mark was keen to teach us how to get the basics right (RB's founding mantra) and how to keep dishes simple to experience the textures and individual flavours. I learnt how to make a perfect pesto, a light refreshing summer vegetable soup and salads that were anything but a side dish. The course is very interactive and includes a short tour of the grounds where you are able to sample fresh growing ingredients from fruit, mushrooms or micro herbs it is all grown onsite. Since returning home I have felt inspired to grow a small selection of kitchen herbs as it really is impossible to return to the dried variety! It is safe to say that I have never had a first impression quite like that of The Enchanted Manor located in Niton (Near to Ventnor) on The Isle Of Wight. I was told to expect something very different and very different it is. It is unique. The word unique is so overused, I know I often do it, but The Enchanted Manor genuinely is, in so many ways. The Manor House was originally called Windcliffe Manor, dates back to the early 1800s and was the family seat of The Kirkpatrick family. Owned today by Ric and Maggie Hilton who bought the house at auction in 1998 it has been transformed into the most magical guesthouse in the UK, perhaps the world. Those familiar with The Isle Of Wight will know that it is full of single track lanes and steep winding coastal roads, especially in Ventnor. The Enchanted Manor is around 10 minutes away in the small village of Niton. The hotel can be found nestled in a dimly lit lane walking distance from the local pub. My first impression was one of bewildered awe and slight nervousness. I have never seen so many fairies or mythical creature figurines in one place at one time! I parked the car a few feet from the unicorn statue and followed the fairy lights across the bridge of the miniature village to check it at reception. Rather dumbstruck I stood gazing at my surroundings; every picture on the wall colourfully depicts romance or fantasy. The conservatory dining room is full of greenery and rustic wooden seats, I'm not sure JR Tolkien could have created anything more hobbit or pixie-like and he's the authority on these matters. My suite was in keeping with the hotel, it was a room fit for a princess with four poster bed, golden linen and roll top bath. Laid out on the dressing table was a Gilchrist and Soames gift box right next-door to the life sized fairy. Yes you did read that correctly, it was a surprise to me too! Especially in the early morning, half asleep half light. Ric and Maggie couldn't have made me feel more welcome, they are what make this hotel extra special although Maggie might argue that it's some sort of sprinkling of fairy dust. Ric and Maggie clearly love what they do, they specialise in small romantic weddings and have a beautiful garden which is a real extension of the manor house. The level of hospitality and service is just perfect but don't just take my word for it, there are 360 excellent reviews currently on Trip Advisor in addition to the numerous awards that have been won over the last decade. The Manor has featured on several television programs and has become a favourite with many celebrities. The fairytale theme is just a bit of fun, but with Ric and Maggie, when they do something there is no glass ceiling and they do it to the best of their ability, I can't imagine this hotel ever being referred to as "Windcliffe Manor" ever again! The Enchanted Manor doesn't have its own restaurant however breakfasts and afternoon teas are outstanding. Ric and Maggie also host cheese and wine evenings for new guests which often run into the late evening and if you're lucky, perhaps one of Maggie's general knowledge quizzes! There are two very good dining options located close by. The Buddle Inn is walking distance and is an award winning pub serving traditional favourites and real ales. In Ventor I'd recommend The Hambrough Restaurant originally run by Michelin starred Chef Robert Thompson, Head Chef is now Darren Beevers who is keen to maintain the high standard and reputation of this fine dining restaurant.